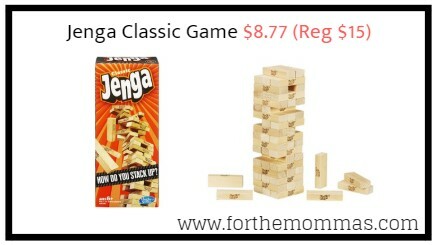 Amazon has Jenga Classic Game for $8.77 (Reg $15) with FREE Shipping on orders over $25.00 or with Amazon Prime Orders. It’s the perfect game for everyone, with edge-of-your-seat, gravity-defying action. Do you dive right in and pull your block, or take your time and study the stack? Any way you choose, show your Jenga style!